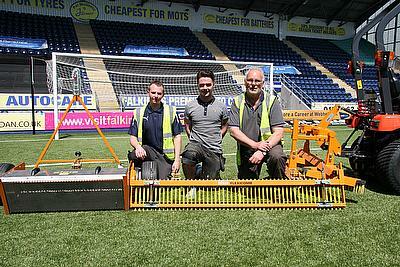 Joe Wallace - head groundsman at Falkirk FC has a range of SISIS machines to maintain the synthetic pitch. Joe, who originally started his career as a greenkeeper, needed to purchase a whole new range of products when the new synthetic pitch was installed two seasons ago. Having been impressed with using Dennis mowers when the club played their home games on grass, Joe decided that he couldn’t go wrong with SISIS products. “I knew that SISIS products were built by the same company and I’ve used other pieces of SISIS equipment in the past on golf courses. The machines I used were always reliable and they are manufactured here in the UK which I think is important – parts are incredibly easy to come by,” he said. The pitch at the Falkirk Stadium is not only used for training and match days by the first team, but it is also available to the local community and is a popular venue for concerts. With the likes of Tom Jones, Elton John and Rod Stewart playing at the stadium in the last two years, Joe and his two members of staff, Bob Lochhead and Cameron Clydesdale, have to ensure that the pitch is thoroughly cleaned after such events. To do so, they use the SISIS SSS1000 – a tractor mounted sweeper which can be pulled by any machine. There are no tools required for the adjustment of the brush or the angle of the draw bar and to make storage easy the draw bar lifts to an upright position. With an aluminium hopper with stainless steel mesh, any infill that is collected when using the machine is returned back down to the surface leaving it free from contamination of debris. “We get a lot of debris on the pitch after concerts and because we have so many children playing on the pitch we find a lot of bottle tops and other things like that which contaminate the pitch. We use the SSS1000 twice a week to keep the surface nice and clean and it stops the actual crumb from getting contaminated,” said Joe. As well as the SISIS SSS1000, Joe uses the SISIS Twinplay tractor mounted implement frame, which can be fitted with several implements for the maintenance of synthetic surfaces. He attaches the SISIS straight brush and the SISIS Zig Zag brush to even out the rubber crumb before attaching the SISIS Flexicomb. 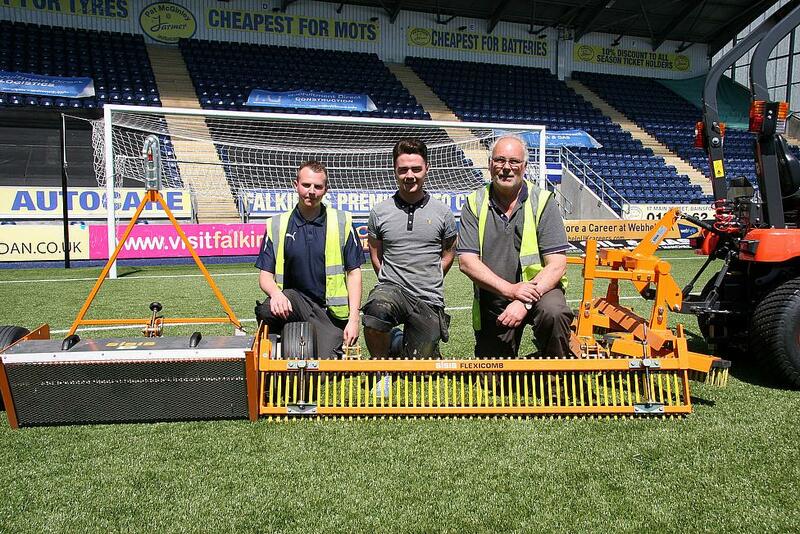 The Flexicomb maintains infill levels at a constant depth to give a consistent playing characteristic and Joe believes it is perfect for the surface at the Falkirk Stadium. Not only does the Flexicomb do an outstanding job in making sure the pitch is in pristine condition at all times but Joe has also found another use for it. “On two occasions this winter we’ve had maybe two or three inches of snow and we put the Flexicomb over it to brush it all off. We couldn’t use a plough because it would have taken the crumb off but the Flexicomb pushed the snow off and left the crumb on the pitch. So it doubles up as a snow plough which is great!